To read the first half of this list, My Favorite Seams #6 through #10, click here. ♫ Rolled edge on roses and flat seams on mittens...♫ Here are my Top 5 Seams of 2013! Yes, seams! We sew lots of them. Seams. 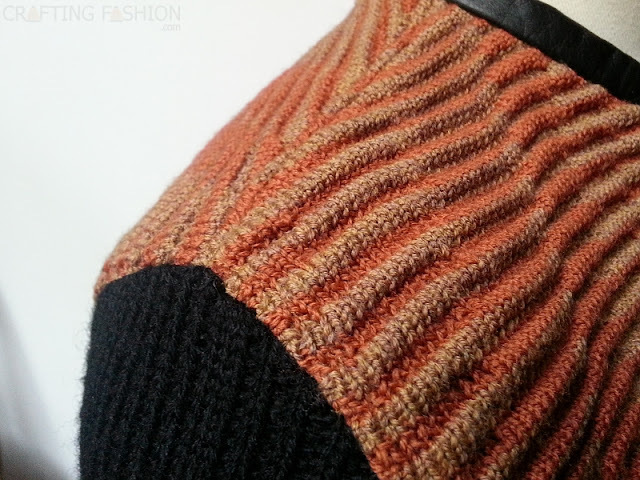 And since this blog focuses on working with sweater knits, I stitched each seam on my list on sweater knit fabric. Last week's post started with dealing with the rolled edges on jersey when making a seam. This week's post starts with this year's favorite seam #5, the seam at the thumb on the mittens below. Almost a year ago, this seam was a real eye-opener for me. At the time I was a woman with her very first serger, who happened to be serging every seam in sight. Then while making my version of these mittens on Purlbee, I came across a seam allowance that had to be pressed open. My side seams on my Houndstooth and Lace Sweater come in at #4 on the list. Exact matching of houndstooth, a pattern lacking a vertical line of symmetry, on both sides of a garment with shaped seams is impossible. Coming close takes planning and decision making. I'm mostly happy with the way it came out. Is a hem considered a seam? For the sake of this post, it is. And it's #3 on my list. 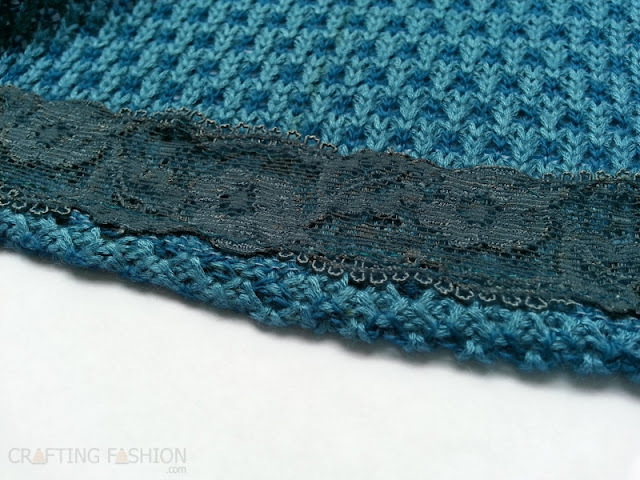 I was simply thrilled with the way lingerie elastic worked as hem facing on the Turtle Beach Sweater. Lingerie elastic is softer than the stuff sold in stores as lace hem tape. Lingerie elastic is also pretty, and it stretches. 'Nough said. I'm really liking the look of binding used to encase the cut edge of a sweater knit. The self binding in the sweater below is #2 on the list and was somewhat of an accident on my Hip to Be Square sweater. I'm so glad that my main fabric was lightweight enough to be used this way and that the stitch pattern texture worked with this placement. Binding, cut on the lengthwise grain and encasing the bottom edge of the Hip to Be Square Sweater, looks wider from this angle. And here it is <drumroll> my #1 favorite seam of 2013 was used on the ridiculous thickness of seam allowance on the Zipper Rippled Jacket. Making a seam this way is counter to what I was once taught -- that seam allowances on heavy fabrics must be pressed open. In this case the thick, ripples of the double knit jacquard cannot be pressed open. The fabric simply will not cooperate. My #1 favorite seam required two passes. The first pass was with the serger, right sides together, using a four-thread overlock seam. This pass flattened the seam allowance nicely. Next I steamed the seam allowance to one side and topstitched it in place on the right side using a very narrow zigzag (0.75 mm width) on the sewing machine. The serge/topstitch combo tamed the seams for a nice finish. You can kind of see the topstitching on the shoulder and also where the sleeve attaches to the bodice, but the stitches tend to sink into the thickness of the fabric. They are only slightly more visible in person. This topstitching is more utilitarian than decorative. Well, that's my list and my last blog post of 2013, though I'll still be around on Instagram and Twitter. I wish you joyous holidays! Happy seaming in 2014! If you missed the first half of this list, My Favorite Seams #6 through #10, click here. Love the lingerie elastic trick! Will try that next time I sew on any knit fabric. Update to my comment on your previous post: I DID sew on sweater knit before albeit a thin sweater. 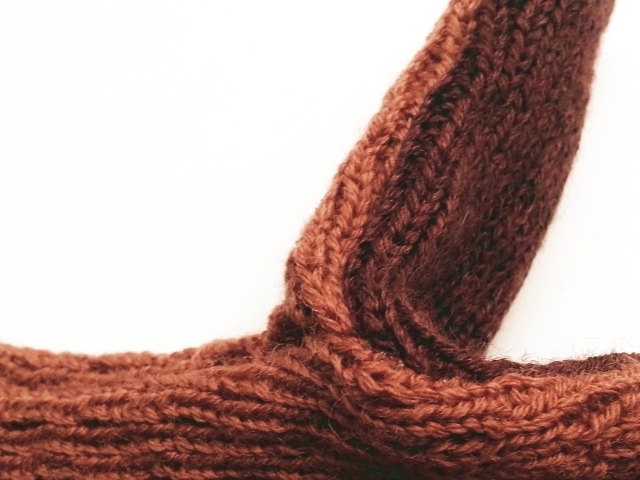 I was re-fashioning two sweaters into one, and it sewed like a knit interlock rather than a thick sweater knit. Also, I cut up a thin cashmere cardigan into a couple of scarves. Tried to include a link to my flickr page but not sure it will "take". Have a great New Year and the rest of the Holiday Season! Yes, I did a little cut and paste to see your work! (Unfortunately you have to include html for the link to "take". ) Awesome! 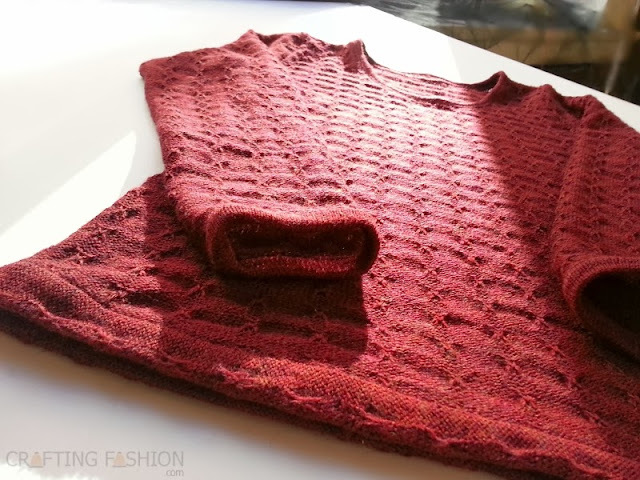 You're on your way to more sewn sweater projects! Let me know how the lingerie elastic works for you. Best wishes for the holidays and a fab 2014! 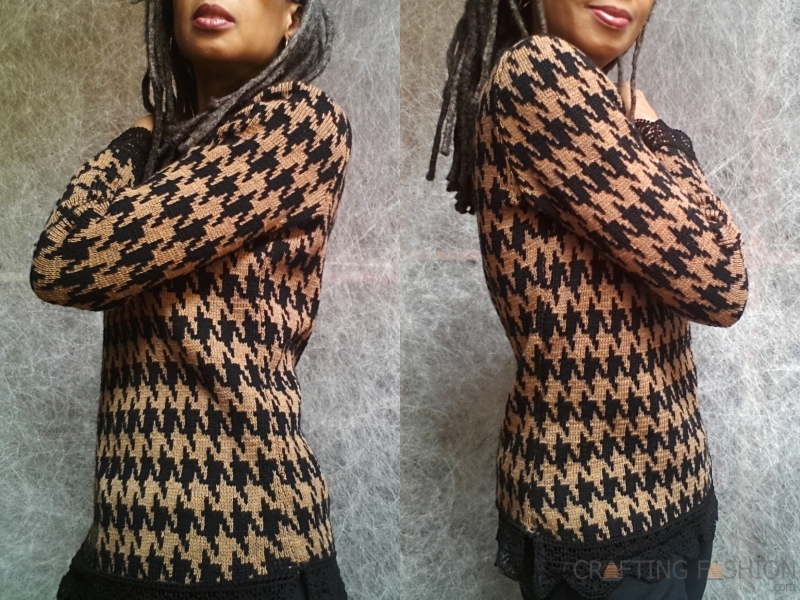 Love your houndstooth sweater! I looks great. And I love the colors of all the other sweaters in this post. I don't have a server but I'm thinking of getting one next year. Happy holidays! Thanks, Chuleenan! Sergers are fun and oh so helpful. :) Happy Holidays!